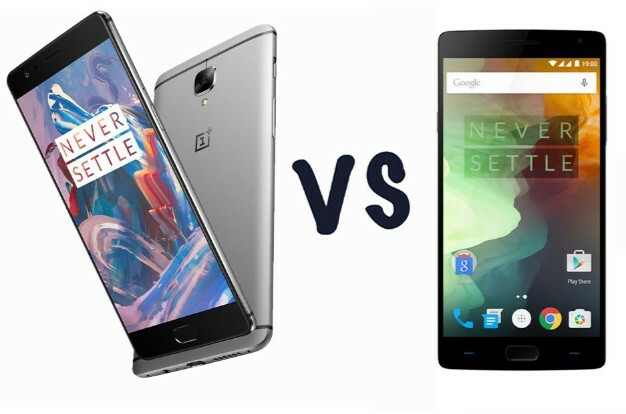 You are here: GeekSays Technology News » General » OnePlus 3 Vs OnePlus 2, Which One To Buy? OnePlus 3 is already out in the market which came along with a premium look and hardy body. Even though One Plus, the name is not that popular in the Smartphone world, but the company is known for delivering a quality built product that looks finest and is as solid as solid as possible which is highly noticeable in the all metal design OnePlus 3. The company has started selling their flagship device in the US and Europe in June 14th while India and China got it in 15th June. With this, many users are still in dilemma and can’t decide which set is better between the OnePlus 2, OnePlus 3 and which one to buy to be benefited. Here is a clear description of both the devices so that users can go for the winner one. Starting with the display, both the device sports same size screen of 5.5 inch having 1920 x 1080 resolution but OnePlus 2 sports a LTPS LCD FHD display while the other one have FHD Optic AMOLED display which provide much better color contrast. OnePlus 2 chose to incorporate Qualcomm 64bit Snapdragon 810 octa core processor clocked at 1.56 GHz. This device is currently available with 4GB DDR4 RAM along with 64GB non-expandable storage but OnePlus 3 saw a great improvement in the processor that includes Snapdragon 820 quad core processor clocked at 1.6 GHz. This flagship device is paired with 6GB DDR4 RAM along with non-expandable 64GB storage. Camera is another section to receive highly noticeable improvements and this point no doubt keeps OnePlus 3 far ahead of OnePlus 2 in the competition. While OnePlus 2 is packed with a 13MP rear and 5MP front facing camera the other device sports a 16MP rear and 8MP front facing camera. But the battery capacity of the later one is made 3000mAH while this is 3300mAH in OnePlus 2 , however, OnePlus 3 is again built with rapid charging facility that can charge up to 60% in just 30 minutes. OnePlus 2 have fingerprint scanner but no NFC while OnePlus 3 includes NFC and fingerprint scanner both to support Android Pay and mobile purchases. Of course there is difference in the price and OnePlus 3 will cost you around $399 while the other one is priced at $299. But finally it can be said that OnePlus 3 win the game no doubt with its higher specification and improved performance.